“Nick and I look at each other. ‘I’m not holding your hand,’ I tell him, smiling a little. An absolutely hilarious and adorable read, Becky Albertalli’s Simon vs. the Homo Sapiens Agenda is an insightful story that will bring readers to tears, both from laughter and woe. After a student beings to blackmail Simon after discovering his secret, Simon must follow all his requests or his (and his anonymous friends) secret will be vocalized to the world. Juggling family oddness, quarrels in friendships, accepting himself and hopelessly falling for his mysterious pen-pal, Simon’s adventures will make it nearly impossible to put this book down. “Love, Simon” is a new film to be released in 2018, based on Albertalli’s hit YA novel. Since it looks really interesting, I finally decided to go buy the book and give it a go. Let’s just say that I wasn’t disappointed. Full of a multitude of important coming of age issues yet still a hysterical read, Albertalli’s novel is a wonderful read that reflects many issues and concerns teens face in high school nowadays. The novel follows Simon, a boy who identifies as gay yet hasn’t come out to anyone yet…other than an anonymous pen-pal he met through Tumblr. After a fellow student discovers his secret, Simon is compelled to do as he asks, not only to protect his secret but his pen-pal as well. Talk about a crazy start to a novel! Throughout the story, Albertalli’s novel addresses a number of issues and trials that so many teenager’s go through: blackmail, cyber-bullying, self-acceptance, identifying with the world, family connections, friendship troubles, harassment, and identifying as part of the LGBTQ+ community. With the rise in technology and use of social media outlets, bullying and harassment has become a whole new ballgame, simply adding to the ways in which we can hurt one another. But Albertalli’s tale also shows the beauty of friendship, family and self-love. Though Simon and many characters experience personal dilemmas, they overcome these issues and see love where there is hatred. Where there are bullies, there are heroes; where there’s stigma, there’s also praise; where there’s fear, there’s hope. Not all the issues are solved by the end of the novel, but I think that’s what makes this book so relatable and authentic, because sometimes…not everything is fixed with a neat little bow. The reason for the 4 cups of tea? I felt the book wasn’t long enough and didn’t hold enough content. Not all the issues needed to be solved, but I felt this lack of fulfillment with the story. I wanted Albertalli to dig deeper and focus longer on the difficult matters Simon and the other characters go through in the novel. Simon, our main character, grows immensely throughout the novel. Learning to accept himself, to trust in others, that there are good people even when it appears that the world is against you, how to watch what you say, and so much more. Simon is a victim throughout a large portion of the novel, but he also makes mistakes which causes his friends to feel hurt. So not only does Simon overcome his own sufferings, but he learns to recognize his own faults and to better understand how his actions can have unfortunate consequences. Though the other characters in the novel aren’t as focused on, their personal development is also shown throughout the story. Some learn that remaining silent can cause friendships to dissipate, while others learn that what they considered harmless acts are actually forms of bullying. Not all characters are lovable, but I don’t think they’re all meant to be. Simon though…he’s just super cute! Is it sad to say I’ve never thought about it this way? Because honestly, Simon’s point of view is right; there’s this THING about coming out to the world when you are part of the LGBTQ+ community, but is it really anyone’s business? Why should we ASSUME people are straight unless they otherwise say so? It’s points like this that make both the characters AND the readers grow, which I find the most astonishing and focal point of this novel…we all have room to grow. The language is very comprehensible, making it extremely easy to finish this book in one sitting. It flows well and uses jargon that most people have heard of. Albertalli does a remarkable job of writing how a teenage boy would talk; I honestly forgot at points that I was reading from a novel for it felt like I was reading into Simon’s most inner thoughts…almost as though I was reading a journal or diary. This is probably what made the book such a hoot, having me in tears at some points; the language gives off Simon’s personality without Albertalli having to actually have the character describe himself to the audience, and his personality is sarcastic jokester who finds comedy in all aspects of life. Albertalli’s Simon vs. the Homo Sapiens Agenda is an extraordinary coming of age novel, bringing to life the ups and downs of being a teenager in this modern world. Not only is the story compelling, but Simon’s witty personality along a cast of amazing characters draws you in that you can’t help but ask for more once the novels complete. Though it’s a comedy at heart, Albertalli wonderfully remarks on important issues that people of all ages should know about. Anti-bullying and acceptance are just as big of themes in this novel as comedy and love. 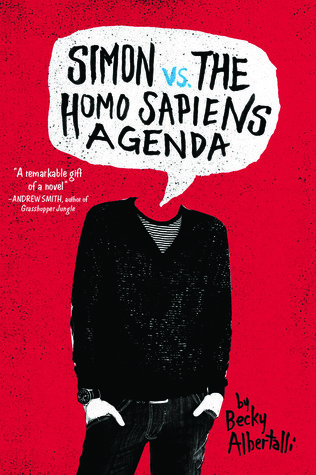 Have you given Simon vs. the Homo Sapiens Agenda a chance? Very nice review! I have read this book, and I liked it, but I think all of the overwhelming hype made my expectations a bit too high, so I didn’t love it. Thank you so much! And I agree; the hype it what ultimately made me have tad bit of disappointment. Overall though it’s a wonderful book!! It is, and I do think people should read it. I just wanted a little more from it. Maybe some of that story will be told in Leah on the Offbeat. I really enjoyed this one as well – I finally got around to reading it after hearing about it when it first came out. It was the movie that spurred me on as well! Albertalli did a wonderful job of voicing many LGBT individuals’ battles with heteronormativity and the movie will hopefully take it a step further putting it into others minds the challenges/ideas around coming out. I’m glad you read and enjoyed it!! I’ve heard the film will open up more upon the topic, more than the novel which I’m excited for. Also…that’s super cool you quoted that section of the review haha! I was nervous about how to word it. It made sense the way you said it. I hope the author is working with them. Her work with LGBT teens would be a huge addition to the film. I agree. I haven’t read up on anything like that but I would like to research and see if she’s working with production and direction.